I saw an adorable bathing suit cover-up on Pinterest and had to give it a try. I used the tutorial from the La Vie en Rose blog. I basically followed her directions, with a few changes. For the record, this took more than the 20 minutes that she claims, but it was probably because of the extras I added. 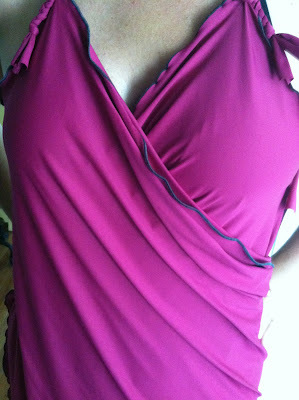 I wanted the top to be more secure so I crossed the braided straps in the back. This proved to be impossible to take on and off, so I put fabric-covered buttons on the front so I can unbutton the straps to take it off. It still isn't the easiest thing to put on and takes a bit of maneuvering, but I think it will be ok. I also used a pink lycra/spandex material instead of using jersey. Instead of leaving the edges raw, I serged the edges with my Aunt Cindy's fancy serger. I stretched the fabric as I serged to make a wavy lettuce edge. I'm pretty happy with the way it turned out. Now its time to hit the beach! Fabric-covered button and braided strap. The edges were finished on a serger with a ruffled lettuce edge. 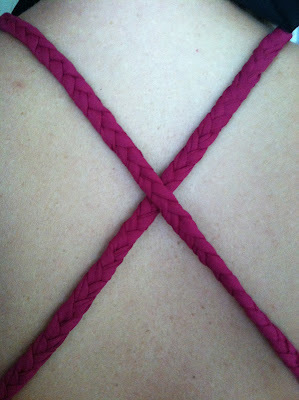 Braided straps cross in the back.